Dubai, UAE, June 26, 2018: The Rado True Thinline Nature Collection is a beautiful fusion of nature and innovation taking the essence of Rado, and blending elements of the natural world into its design. The fruits of a creative partnership with Grandi Giardini Italiani - an organisation that promotes the rich heritage of grand Italian gardens - these additions to the True Thinline Collection celebrate the intersection between design and nature. In our increasingly urbanised lives, great pleasure can be taken from experiencing the vibrant colours of nature. 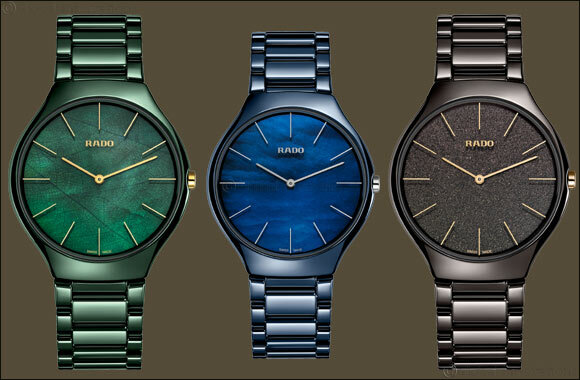 The Rado designers took the very best elements of the natural world and worked to incorporate this aesthetic into these new True Thinline models. Whether it be the rich taupe brown of Earth, the deep midnight blue of Water, or the verdant green of Leaf, each colour rejuvenates the eye like a walk through a beautiful garden leaving it refreshed and inspired. To complement the lustrous cases and bracelets, each piece in the collection involves a unique dial treatment that echoes the natural world. Water gains a painted Mother- of-Pearl dial that evokes the ebb and flow of the open sea, Earth boasts a metallised coating, which reflects and refracts light beautifully, and Leaf sports green Mother-of- Pearl with a leaf structure applied to its underside which shimmers brilliantly in the light. The True Thinline is, in many ways, the ultimate Rado with its full high-tech ceramic construction, pioneering monobloc case and its lightness and thinness working in perfect harmony with its durable and scratch-resistant properties. Now, with the influence of nature, each piece subtly evokes beautiful aspects of the natural world, transforming these timepieces into something truly special, a calming and regenerative visual treat for the wrists of nature lovers.